While Apple and book publishers have yet to come to an agreement on gifting e-books, the company is making active preparations for a possible rollout with a unique gifting method that allows users to buy and personalize items in-app. Apple currently allows iTunes account holders to give songs, videos and apps to friends, but e-books available through the iBookstore are not included among the digital hub's giftable content. A new patent filing, however, shows the company is actively preparing for the contingency. The U.S. Patent and Trademark Office on Thursday published an Apple patent application for "Personalizing digital gifts," which describes a novel method for gifting e-books to friends. As noted in the patent summary, a user may come across a section or phrase in an e-book that appeals to them; perhaps a saying that reminds them of a friend, or an especially touching sentiment. Said user may then want to share the content with another person, which is where Apple's patent comes in. According to the patent language, a user can select the appealing e-book snippet, which will bring up a contextual menu containing an option to gift the media to another party. Recipients can be specified using an iTunes ID, email address, or other suitable form identification. Once the gifting event is triggered, the online store, in this case the iBookstore, is notified and will offer personalization options to the gift giver. 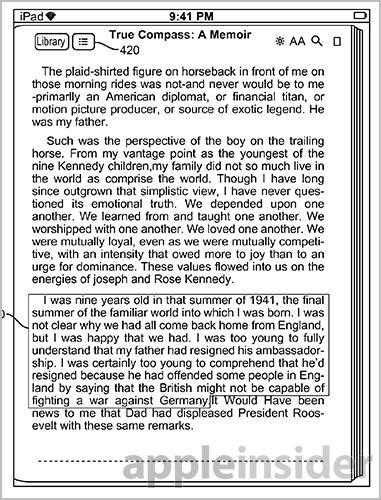 These can range from including the snippet in a message to incorporating it into the e-book file. Alternatively, a user's notes, bookmarks or highlights can be used as the personalized message. After the requisite funds are deducted from the user's account, the store sends a confirmation notification to the recipient via email, text message, social networking website or directly to their device. Here, the patent offers three choices for receipt: accepting and adding the content to a personal media library, deleting the gift and crediting the value back to the user, or re-gifting to a third party. If the recipient opts to keep the e-book, the gifter's snippet, note, dedication page or other message is displayed before the media is opened. 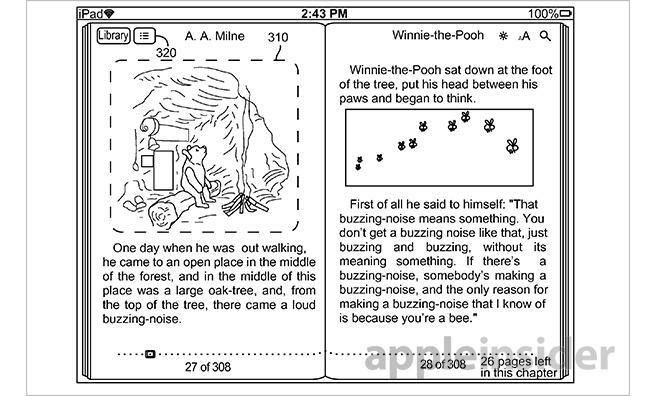 Apple's patent filing also notes that the system can work with other digital mediums, like audio and video files. A form of personalization is already offered, though Thursday's invention allows for on-the-fly gifting from within a media player/reader app. 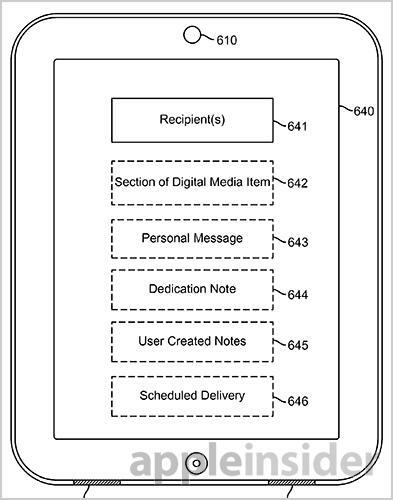 Apple's digital gift personalization patent application was first filed for in 2012 and credits Casey Maureen Dougherty and Melissa Breglio Haji as its inventors.